hornetfinn wrote: Imaging sensors can be further divided to scanning and staring arrays. Scanning arrays have been used in earlier FLIR/IRST systems (Pirate, AN/AAAS-42, many FLIR systems) but staring arrays have really taken over during the last decade. EOTS and DAS use staring arrays as do many later targeting pods and for example DDM-NG in Rafale. Just curious; is the difference between a scanning and staring array to do with having the sensor itself mechanically gimbaling in a housing / seeker head, or is this more of a rolling vs global electronic shutter deal? The F-35 DAS is uses 6 CCD image sensors. These are basically IR sensitive video cameras. Most FLIR systems have used camera tubes or CCD sensors of some type. IRST systems typically use scanning sensors (some are flat arrays that move up and down, others use a 2D scan reflected into a sensitive photodiode) along with a laser for spotting/rangefinding. I'm pretty sure the Russian OLS uses a 2D scan. According to fulcrumflyer the OLS was practically useless. Another US MiG-29 pilot said it was very good at locating the bandit, assuming the jet was pointed at the bandit. The OLS had been upgraded between a Fulcrum-A and Fulcrum-C aircraft. 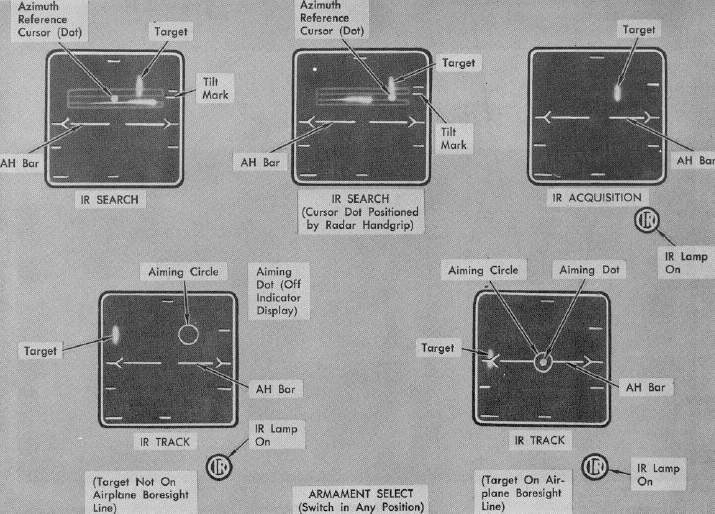 For the record, the F-35 DAS (AN/AAQ-37) is significantly more effective at locating low RCS targets, because of its spherical coverage. I'm not sure if the DAS can accurately detect range, but should be able to cue an AIM-9 without radar lock. This will be the "killer" feature of the F-35 (with AIM-9X missiles) should someone think declaring a "line of death" with a Sukhoi is a good idea. Coincidentally, VAdm. David Venlet who ran the JSF program before LTG Bogdan, was the RIO who downed one of the Su-22s over the Gulf of Sidra. It's very much like rolling vs global electronic shutter type of difference. Basically in scanning arrays there is a linear array of detectors arranged to 1 to few rows (2 to 4 being common). The linear array is then scanned across the scene to develop a single image or frame. So, it's quite similar to rolling shutter as the whole scene is captured within some time-frame . In staring array there is 2-dimensional array (like 1024x1024) of detectors which are self-scanned electronically. So it's quite similar to global shutter as the whole scene is captured exactly at the same time. Because thermal cameras are mostly basically videocameras operating in infrared, they mostly use global shutter type of operation (staring arrays or CCD). Basically it's possible and easier to produce higher resolution images (high pixel count) with staring arrays with less noise (better image quality and uniformity) and have no issues with fast movement of camera or target (no image smear, skew of wobble). These things make staring arrays preferable nowadays along with lower costs. Things were different for example when Eurofighter Pirate sensor was developed (1990s). Then it was technologically easier to produce high performance imaging infrared system with scanning array as it was difficult to manufacture high resolution staring arrays. If Pirate would be developed today, it would most likely use staring array. Passive ranging with IR sensors is an area where quite a lot of research and development has been done. For example there are a lot of patents for passive ranging. Just google "passive ranging infrared patents" and you'll find a lot of patents by the usual operators like Raytheon, Eads, Thales, Saab, Israeli Aircraft Industries, Northrop Grumman, Textron Systems Corp etc. It seems like accurate ranging can be done when enough pixels are available of the target along with good image processing and threat libraries. I'd say EOTS can give accurate passive ranging data from even distant objects as it likely has very narrow field of view (to work as targeting system for A/G weapons) along with high resolution and sensitive sensor which is connected to sensor fusion engine. It likely easily beats any previous sensor system due to these as previous IRST systems had fairly wide field of view even with narrowest ones (not enough space for more powerful optics). DAS will not be able to do accurate ranging besides short ranges (basically visual range) as it has very wide field of view (over 90 degrees) and even with very high resolution sensor can not get enough pixels from targets from longer range to do accurate ranging. Of course for longer ranged ranging and identification there is always EOTS. neurotech wrote: According to fulcrumflyer the OLS was practically useless. Another US MiG-29 pilot said it was very good at locating the bandit, assuming the jet was pointed at the bandit. The OLS had been upgraded between a Fulcrum-A and Fulcrum-C aircraft. MiG-29 uses the least advanced IRST system, uncooled non-imaging sensor which has poor range, poor sensitivity and does not work well in many difficult backgrounds (sea, ground, clouds etc). It's basically 1950s sensor technology, so it's not difficult to believe it's not very effective system. Su-27 OLS-27 was major improvement as it has cooled sensor and thus has much better range (especially head-on) and likely works much better against difficult backgrounds. OLS-35 is better still, but it's a far cry from modern imaging IRST systems like EOTS or Pirate. It can only track (Sukhoi says follow) four targets at once while Pirate can track 200 and EOTS possibly lots more due to having more processing power available. EOTS also more than likely outranges Pirate quite handily as it uses newer technology meaning more sensitive sensor with higher resolution and better image quality and uniformity. I say it's very possible that EOTS has twice the range of Pirate in similar conditions against similar target. It seems like 3rd gen MWIR systems usually have about 2-3 times longer ranges compared to 2nd generation FLIR systems. Technologically for example Pirate and targeting pods of 1990s are mostly 2nd generation IR technology. EOTS and DAS use 3rd gen MWIR system. I think many people will be surprised how powerful system EOTS+DAS is in air-to-air combat. hornetfinn wrote: It seems there is some discussion regarding IRST systems here and there and found this old topic which seems to best fit the discussion. First, I’d like to go through some basic information regarding IRST systems and how they work. First, there are several different types of IRST sensors in use in different fighters. The technology is similar also in different missiles and also FLIR systems (imaging sensors only). 1. Non-imaging uncooled IRST systems. These types of sensors were used in Western fighter IRSTs from 1950s onwards and are still used in MiG-29 OLS-29 systems. These systems have very poor range due to low sensitivity (by modern standards) and can only give indication about direction to some heat source. They are unable to tell the range (without laser) and cannot identify targets as they cannot create images but just detect increase in IR radiation in some direction. These systems also cannot effectively detect and track multiple targets. Similar sensor was used in many older IR seeking missiles. 2. Non-imaging cooled IRST systems. These types are used in for example Su-27 variants (OLS-27 to OLS-35). Some old Western IRST systems might have been this type also. These have much better sensitivity and thus longer range. Otherwise they share similar limitations as the older systems. Many IR seeking missiles have used this type of seeker like AIM-9L/M, R-73, Igla and Stinger. However there is difference in cooling and seeker systems and older missiles using this type had much inferior performance to later missiles. 3. Imaging, uncooled IRST systems. These types have not been used in fighter IRST systems as the cost of using cooling is fairly low compared to other costs involved (for fighter use) and because cooling improves performance a lot. In the future these types might be used in some applications as their performance has improved significantly recently, although will never reach the performance of cooled imaging systems. They easily beat both uncooled and cooled non-imaging systems though in almost every respect. They have decent range and as they are imaging, can also recognize and identify targets close enough to have enough pixels from them. They can also do passive ranging and can detect/track large number of targets simultaneously. These are used in some missiles though, as they are much cheaper and smaller than cooled systems and have performance good enough for many missile applications. 4. Imaging, cooled IRST systems. These types are used in modern Western IRSTs like Pirate, FSO and EOTS. These outperform all other types handily and have all the capabilities of imaging uncooled systems but offer much better sensitivity and thus better range and target discrimination abilities. Imaging sensors can be further divided to scanning and staring arrays. Scanning arrays have been used in earlier FLIR/IRST systems (Pirate, AN/AAAS-42, many FLIR systems) but staring arrays have really taken over during the last decade. EOTS and DAS use staring arrays as do many later targeting pods and for example DDM-NG in Rafale. Compared to scanning arrays, modern staring arrays have higher sensitivity, longer range and better reliability (no mechanical components) and higher frame rate with better image quality. They are also gotten cheaper as manufacturing techniques has improved. Scanning arrays are no longer really used in new products any more as staring arrays can do everything they can but better. I think Western countries abandoned IRST because non-imaging systems weren’t really that good and radar systems were very effective. As new imaging IRST technology has emerged small and cheap enough to be installed on fighter aircraft, IRST systems have suddenly become widespread. I think new systems will be found to be very effective even in air-to-air combat, although they do have their limitations. Especially the F-35 combination of DAS and EOTS, combining short-range wide field of view and long-range narrow field of view systems and having sensor fusion between all of the sensors to automate functionality, will likely be very effective. Nice post, but i have a doubt. I see OLS-35 tells it has TV+IR video. So really it would be similar to FSO or Pirate system. Or i am wrong? You just dropped a graphic that is probably in these boards more than you'd find in any stack of pamphlets a Russian marketing talking head ever passed out at a trade show...in a three-year-dead thread. Might I suggest messaging 'hornetfinn' direct and ask him? He could have loaned you his copy ( viewtopic.php?p=303399#p303399 ) if you needed it. BTW: Video is an output format/signal to MFDs, not necessarily of a unadulterated received 'image', so don't interpret what I'm saying as it not worthy of an answer. smsgtmac wrote: BTW: Video is an output format/signal to MFDs, not necessarily of a unadulterated received 'image', so don't interpret what I'm saying as it not worthy of an answer. What you said is definitely true. 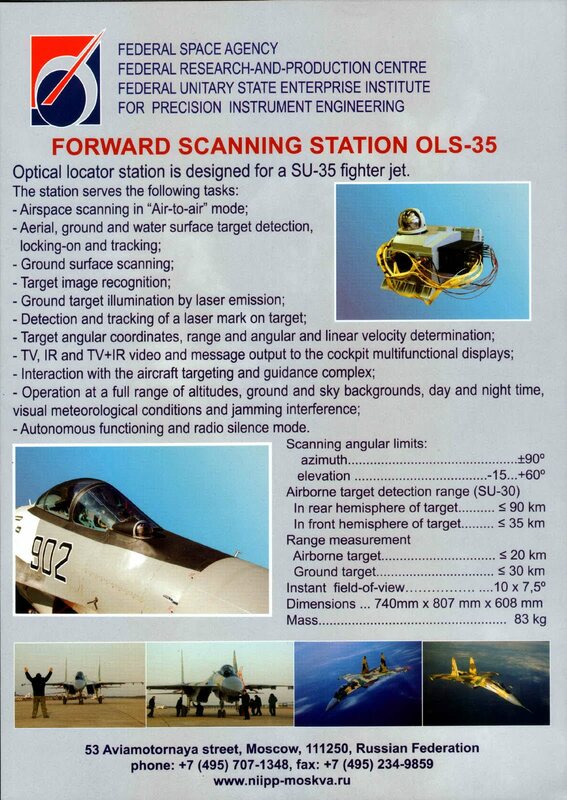 AFAIK, OLS-35 still has just heat seeking system and not thermal imaging system. It does have daylight TV system which allows target identification in good daylight conditions. Video is definitely just an output format and even the oldest IRST systems in 1960s had video output for the pilot. It basically just shows heat sources as blobs like C scope display in older radars. Gums can probably give better explanation having actually operated such IRST systems in F-102 IIRC. I'm sure OLS-35 is better system, but it seems like it's not an imaging system. Of course having - helps in good conditions to identify targets, but it has quite serious limitations. Non-imaging IRST system is far inferior to imaging systems in every way. Of course Russia nowadays has thermal imaging systems and could update OLS systems for significantly better performance. Thanks for you resquest, i understand now. The Russian thermal imaging system that they have now it seems is a copy of Thales-Catherine, but i think it will be a degraded system compare with the original...What do you think? Thanks, now i understand better.